The Yaletown Brewing Company (web site, map, 1111 Mainland St., Vancouver BC Canada, phone: 604-681-2739) is one of Vancouver’s most popular Brew Pubs. You don’t go to a plumber to fix your car, so don’t go to a brewery to eat. Yeah, I know what you’re gonna say. Anyhow, we went at noon on Saturday to sample the important stuff. Of the seven brewed on property, none were bad and three were superb and to my liking. The hefeweisen, Red Truck Ale and India Brown Ale were worth the trip. My beer maid was practically like family and the brewmaster was friendly yet very serious about his brews. 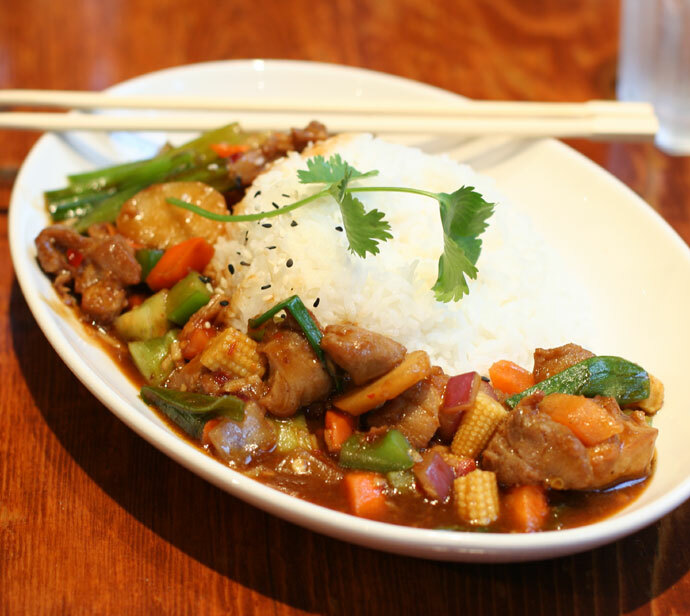 But the YBC has recently added some affordable Asian-influenced dishes to their menu, such as the Classic Kung Pao Chicken ($9.99, pictured below) which was served with toasted chilies, roasted peanuts, garlic, peppers, and jasmine rice. It was nicely presented and tasted surprisingly good. Was a bit hesitant on ordering an Asian dish from this brew pub but they do have a lot of Asian noodle dishes on the menu. The Singapore noodles were very good with lots of meat and shrimp. Very surprised. For more info and another photo please view Part 1. To view their Lunch and Dinner menus, please visit their web site. Kung Pao Chicken ($9.99) from Yaletown Brewing Company in Vancouver, BC, Canada. 8,025 views. This entry was posted on Saturday, November 1st, 2008 at 1:32 am	and is filed under American, Asian, Award Winning, Brew Pub, Burgers, Casual, Chicken, Comfort food, Creative Dishes, Dine Out Vancouver, Downtown, Favorites, Food Photos, Fun atmosphere, Hamburgers, Large Groups, Large Portions, Lively, Lunch, Lunch Specials, Near Canada Line, Open Late, People Watching, Pub, Restaurant, Singaporean, Tourist Attraction, Trendy, Vancouver, Vancouver Restaurants, Yaletown. You can follow any responses to this entry through the RSS 2.0 feed. You can skip to the end and leave a response. Pinging is currently not allowed.